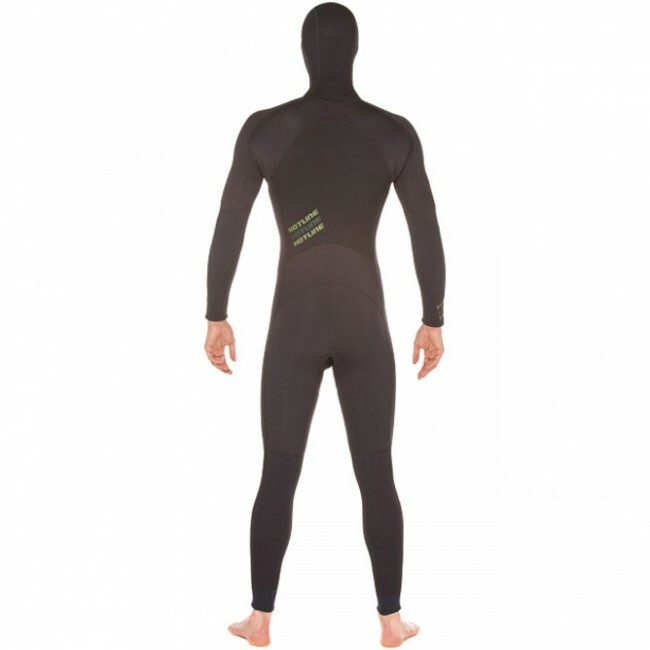 The unique design of the Hotline Ultra Hot Combo 5/4mm Hooded Wetsuit allows for an uncharacteristically huge front entry while still retaining the performance style chest zip closure. A classic from the Hotline Wetsuit family, the UHC touts super stretch "like butter" neoprene reinforced with FireSeam GT Tape on all seams for long-lasting warmth. A full shoulder-to-shoulder zipper removes the struggle of squeezing bulky shoulders through smaller openings, making it a favorite for those who lack contortionist talents and appreciate a simple on and off. Old school warmth and trusty durability make this suit extremely popular in frigid regions. A built-in hood with drawstring insulates your head and a freeze free inner seal offers extra protection in even the coldest climates. Tried and true in extreme conditions, the Ultra Hot Combo is designed with top of the line materials for the greatest comfort and highest degree warmth. *Due to variable shipments from Hotline Wetsuits, logo colors may vary from the images shown here. Second one I have owned! Always keeps me warm! Bomb proof. Easy in and out. Get one you will love it too!! Bought this through Cleanline a couple years ago. Suit is great- super warm and no leaks so far. This winter has been cold enough that I actually wear the hood too. Top notch service from the folks at Cleanline. Will definitely keep scouring here for sales. Small note: the neoprene on this suit is very stiff. I recommend wearing a rash guard underneath for the first couple of months to avoid chafing while the suit softens up. I love my new suit it rocks beyond belief and so easy to get in and remove. The only suit for wide shoulder folk that you can get on and off by yourself. Super warm, comfy for those artic days. easy entry with the full chest zip no torn shoulders super warm highly recommend a rash guard, first session destroyed my armpits without it.. Extra large fits very well at 6-3 215 pounds. Seems like it will be a bombproof wetsuit. I've been wearing the UHC for many decades. They just get better! 70% of my surfing is alone and I have no problem getting in and out of my suit by myself, even at 68 years old. Unlike many of the other styles that require someone to help get it off. Josh and the crew has always taken great care of my needs and I highly recommend buying from them. Also there is an extra charge to get the suit made in America and I highly recommend it. Enjoy surfing warm with UHC! Cleanline rocks! Great service, great prices and they even sent me a free tshirt and a Christmas card:-) So cool, Thanks!!!!! This is my third or fourth Hotline. Fits me perfect so I can just order a new one online, easy to get in and out. No holes or tears in any suit. I keep my old suit for summer use and get a new hotline every 2- 3 years. I surf a lot just below the Oregon border 47-59 water temp, never get cold and I believe its the only wetsuit made in the USA. This is my second Hotline. The first one is still useable but has lots of worn spots after 12 years of service. Prior to that I had a succession of other brands none of which lasted over a year. Hotline is the most durable wetsuit I've ever owned and they have made great improvements. The front zipper makes it extremely easy to get in and out even when it's wet from the first sesh. The hood has a double shroud design that does a great job keeping water from entering when punching through waves. Two thumbs up! Just purchased this suit and have one session under my belt. Used to buy Hotlines a long time ago, but strayed for the sake of trying something different. Really like the fit & finish and materials they are using now. Chest zip makes it easy to get in and out, chest zip is nicely concealed with the zipper flap, I like the fact that when I pull the hood back, the suit is not putting pressure on my throat like the suit I just replaced. Materials feel really durable and the suit will last a long time which I tend to use. Looking forward to buying another Hotline this spring when I replace my light-weight suit. The Hotline UHC 5/4 Hooded is the most durable and fastest entry wetsuit I've ever owned. My Hotline has a super worn out logo on the sleeve cuff that reads "Millennium Edition". I bought it on a sale in 2001 from Cleanline. It's never had to be warrantied. There are glued up fin cuts, the logos are mostly rubbed off, and I need to re-sew half of the visor back on, but this wetsuit is still in regular use. For a burly, reliable, fast entry/exit wetsuit I'd recommend a hooded Hotline any day of the week. Flexible and warm. Time will tell how it will hold up but it appears to be really high quality so I'm expecting it to last quite a while. Chest zip is super easy to get in and out of. Highly recommend. I like Hotline suits. I've had several over the years. They are true to size. I like the front zip for easy on and off. I like the fact there is no smooth skin neoprene panels for better durability. It's a great suit for the money. This is my first wetsuit. I got a man's suit, which fits fine, except that there is extra room in the crotch - hilarious! I wouldn't say it is easy to get on and off, but I don't have anything to compare it to. It is possible. Once on, it wears like a thick skin, and bends in all the proper places without bunching or wrinkles. Swimming around in it, I noted extra buoyancy, and had trouble getting my legs to hang low enough to use them in either a flutter kick or a frog kick. Not sure if this was a bubble or if the neoprene floats. Anyway, though I did have to learn a new way to swim, I felt drown-proof in that floaty thing. I got a 5/4, and in my 42º water, it was sufficient to keep me from hypothermia. Yay! Very impressed with the Hotline suit. I've worn lots of suits in my 45 years of surfing and never has a suit fit so perfectly and never cold in 41 degree water with the outside air temps in the mid 20's. Easy entry and exit... no contortions required. I'm 6'3'' and 190 and the XL fits superbly. 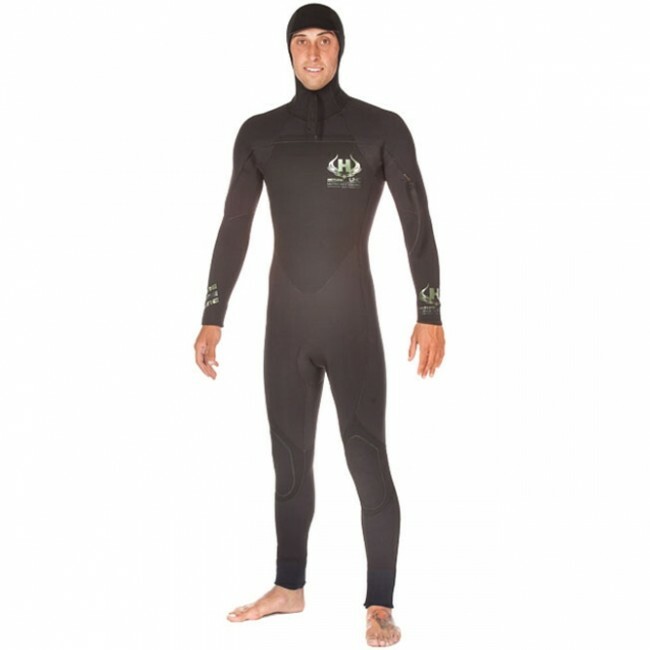 At Cleanline Surf we specialize in sizing Hotline Wetsuits. If you have any doubt about the size suit you need please give us a call and speak with one of our wetsuit experts. Getting the right size wetsuit is extremely important and in the end it will save you both time and money by avoiding a return. Hotline Wetsuits carry a lifetime warranty on workmanship and a one year warranty on materials, provided you care for your suit with care instructions provided.